So, how was your October? I bet you were busy nurturing your e-business growth. That’s cool. Here’s a friendly advice though - give yourself a rest sometimes. And now, at the time you’re reading those lines, it’s a perfectly good time to do it. 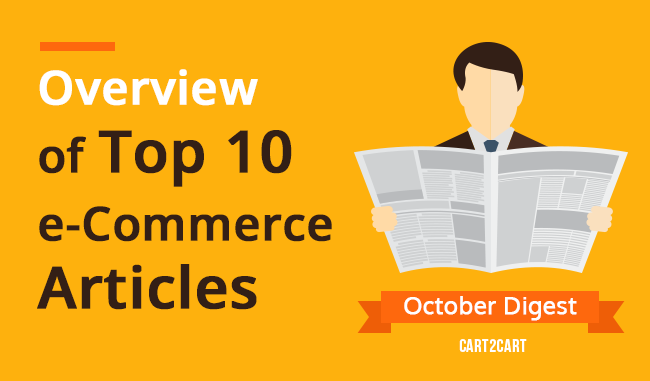 If it happens you’re not into having a leisure time away from your computer screen, let me offer you an excellent overview of top 10 e-Commerce articles of October. Informative, useful and fun to read, the digest contains writings from several most reputable industry sources, such as Kissmetrics, Shopify, Cart2Cart, and Entrepreneur. Get yourself a cup of tea, there’s plenty to read. 1. The fact that holiday season is approaching at full steam is a surprise for none. Right? If you’re still in a process of getting ready for the most lucrative time of the year, “Preparing Your Ecommerce Company for a Banner Holiday Shopping Season” should help you with that. Follow those simple and practical tips and increase your chance to grab a bit of that $105 billion holiday revenue expected in 2015. 2. Most companies do email marketing wrong - that’s the bitter fact we need to face. And a great opportunity of getting a competitive advantage for you to seize. “7 Automated Email Campaigns That Win Customers and Keep Them Coming Back” article is, perhaps, one of the fullest guides that covers every aspect of establishing an email campaign that converts. A perfect follow up on our recent Magento Newsletter article. 3. In case you’re tearing up choosing a hosted solution between Shopify and Volusion, the following article will most probably put the end to your hesitance. “Shopify vs Volusion - An Honest Review“ covers each nuance of every least important decision-making factor to answer an ultimate question “What’s better for my business?”. Conclusions inside. 4. In one way or another, every customer makes their way through a sales funnel as a lead. However, it takes a lot to engage with them at every stage of the funnel properly. “How to Get More Customers in Your Sales Funnel with Engaging Lead Generation“ covers how you can entice users to take the first step, and keep them engaged as they make their way through to becoming loyal customers. 5. Ask yourself: are my product pages as good as they could be? If you answer it right (and say “No”), consider it as a call-to-action. “10 Elements to Apply Now in your Product Page” contains an extensive list of beautifully illustrated hints on CRO by designing a killer product page. 6. What’s the difference between a grouped product and a bundle product? Or how does a virtual product differ from a downloadable one? Not 100% sure? Then “Magento Product Types Explained” will surely come in handy for you. A few intelligible examples provided in the article will help to learn those simple truths once and for all. 7. Some time ago, when aiming to perform a purchase, people would mostly ask their friends about products. But now, they rely on online reviews instead. And though getting review is not so easy, getting a good review is even harder. “5 Techniques to Get 5 Stars: How to Get More (and Better) Online Reviews” explains on what measures to take to stimulate people to leave qualitative and positive opinions about the products you sell. 8. When a business solution, tool or technology gets popular among businesspeople, there’s usually a good reason for it. The same applies to e-Commerce platforms: the more people prefer a particular shopping cart, the more credible, qualitative and solid it usually is. But what solutions do people prefer? Accompanied with comprehensible graphs, “Top Shopping Cart Migration Trends: Inside Data from a Leading Migration Service“ gives the fullest statistics on a subject. 9. You appear to have a blog, but not to many readers, right? That’s a typical issue. However, your chances to succeed in growing an extensive reader audience are about to grow up a little bit. “17 Free Online Tools to Help You Grow Your Blog to 1 Million Visitors” article lists and describes the most useful and cost-effective solutions -- proved by practice -- to get your blog visible on the web. 10. Finally, the last article of our October overview is “Top 5 Best Payment Gateways Reviewed and Compared: Worldpay vs Authorize.net vs Adyen vs Stripe vs PayPal”. This solid, thought out piece of writing compares 5 world’s most widespread payment gateways and gives an unbiased conclusion concerning the prospects and advisability of offering them to your clients. Well, that’s all what we got here this month. I hope you had a good time reading our October digest, and will come here back again for more. Have you came across any other useful article in October? Share with us in the comments below!